Objective: The deletion of the short arm of chromosome 18 is thought to be one of the rare chromosomal aberrations. Here, we report a case to review this disease. 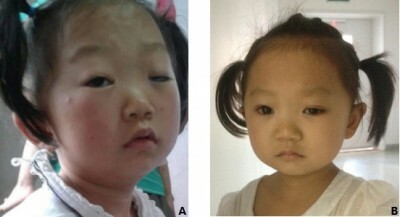 Case report: The proband is a five-and-a-half-year-old girl who has had phenotypes manifested mainly by ptosis, broad face, broad neck with low posterior hairline, mental retardation, short stature, and other malformations. Chromosomal analysis for her mother showed a normal karyotype. Her father and younger brother were phenotypically normal. Result: Phenotypical features were quite similar throughout other cases and in accordance with the usual phenotype of del(18p) suggested within the same cases and among the del(18p) cases described. She underwent blepharoplasty, which improved her appearance. Conclusion: 18p deletion syndrome is diagnosed by gene analysis. Plastic surgeries for improving the appearance might be an option for these patients.